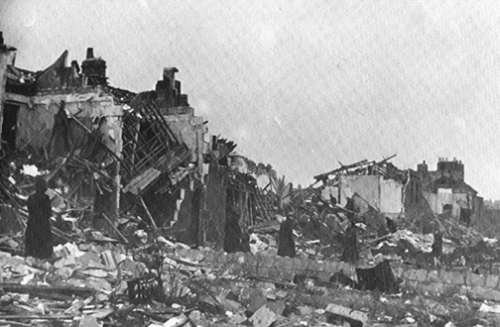 Two 1000Kg bombs struck Elm Grove Terrace. Little survived of the original 17 houses. Elm Grove Terrace was unfortunately placed: alongside the Somerset and Dorset railway where it bridged the Lower Bristol Road, and close to the gas works. The size of the bombs suggests that either of these, rather than the terrace itself, was the real target. 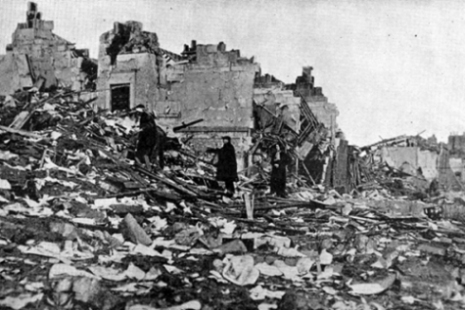 A member of a Rescue Squad remembers saving an old man from the ruins. The terrace was not rebuilt. Pitman Press extended their premises into part of the space, and the remainder was occupied by a Tyre and Exhaust Centre. Use this Next button to view the picture pages in sequence.